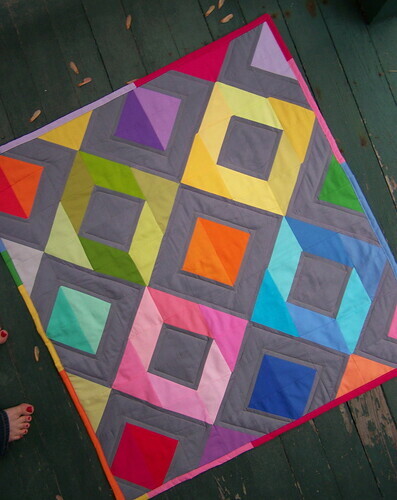 Featuring Lindsay — A Bloggers’ Quilt Festival Quilter! Today’s featured quilter is Lindsay! Lindsay has a fresh modern vibe to her quilts and I love her use of solids, I hope you enjoy getting to know Lindsay better! 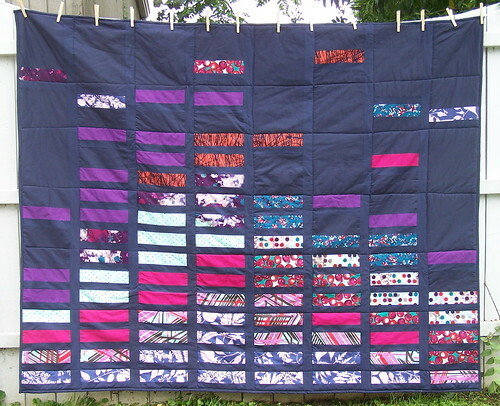 About 3 years ago, I sewed my first quilt just to try out a tutorial I found online. 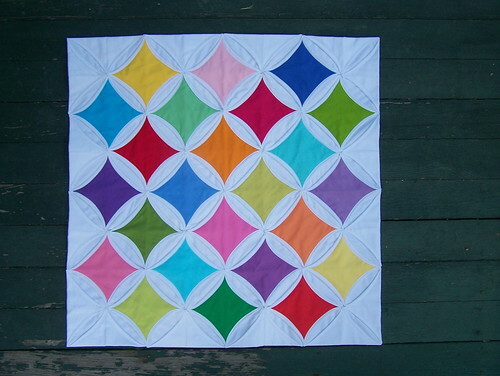 I thought, “I can do that.” I bought a Moda 1984 charm pack on eBay for less than $5 and used a disappearing 9-patch pattern, although I didn’t know what it was called back then. In true Lindsay fashion, I just tried to figure out the binding technique myself, rather than read directions anywhere, and it was certainly interesting. I ended up gifting it to a friend for her first baby, and the quilt has been well loved! I have to do something with all that fabric I like to collect, right? I quilt because it is exciting to be a part of the quilting/sewing community, fun to learn and try new blocks and techniques, and wonderful to feel like I’m growing as an artist. Pairing fabrics is definitely my favorite part of the quilting process, but a close second is creating something that is incredibly useful, beautiful, and thoughtful. 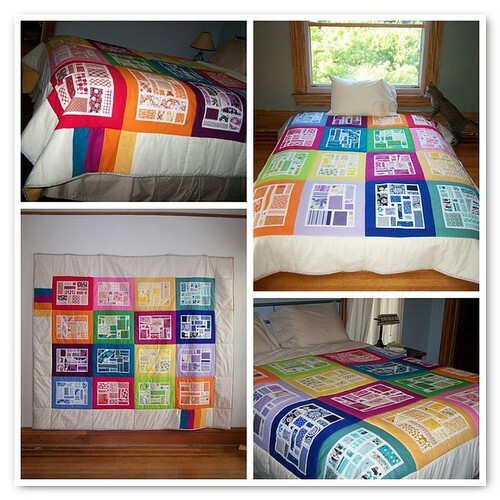 Quilts make great gifts, and I find that the creative process is a nice balance to my day job as an editor. If I am not inspired by fabric (meaning, it’s been sitting in my stash for over a year untouched), I think it’s worth finding that fabric a new home. To trade fabric, I’d recommend joining a fabric swap group on Flickr or listing it on eBay or Etsy as a destash. A decluttered and picked-up craft room is key to me actually wanting to spend time in it! I created this quilt with springtime in mind, and liked the idea of bits of color peeking through the gray, much like Indiana weather! I actually stitched up the half-square triangles before I knew how I wanted to arrange them, and it was fun to jump in without much of a plan. Before I began quilting, I got into sewing clothing, bags and stuffed animals. I’m super excited that one of my stuffed animals will be published in Fabric-by-Fabric: One-Yard Wonders, coming out later this year. 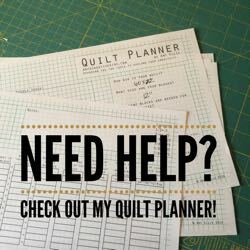 I blog at Lindsay Sews and Craft Buds. At Craft Buds, we host a weekly linky party for craft supplies and handmade giveaways, and post lots of free tutorials and handmade business tips. This September, we are hosting a special event called Craft Book Month all month long, and it’s a festival of sorts for craft book lovers and aspiring authors. 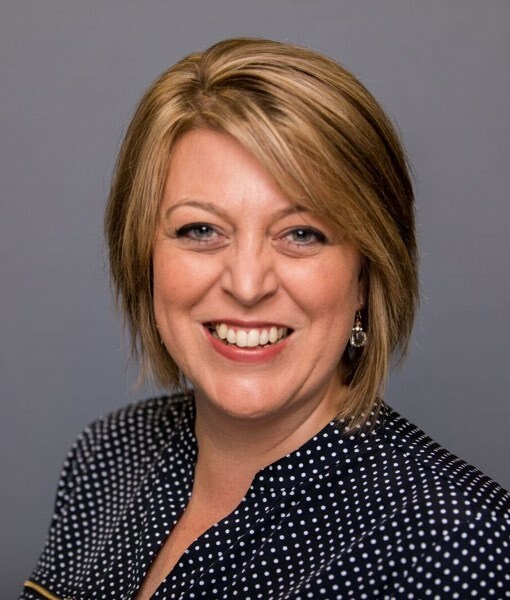 Would love to have you stop by! Thanks for sharing Lindsay! I love your tip – swapping for fabric means it’s new to you, that’s always a score! I love Lindsay’s bold use of color! I like Lindsay’s inspiring use of solids. 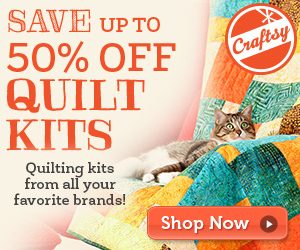 I didn’t know you’ve only been quilting for 3 years. I thought it’s been since birth! Good to read more about you. Love seeing my favorite quilts in one post like this … you are so creative with your use of color, Lindsay! Oh yeah! So excited to see you featuring Lindsay! I have been a fan for quite a while! Love Lindsay! Thanks for featuring her!